Source: #33. — "The Fountain of Christ's Blood," in the Journal of the Folk Song Society. No. 7. Being the Second Part of Vol. II. (London: Printed for the Society by Barnicott and Pearce, 1905), #33, pp. 133-134.
of mercy to invite us in. And hear Him breathe His dying groans. He shed His rich, redeeming blood. Only to do poor sinners good. He sold His pain. His fleshly store. With ragged nails, through hands and feet. They nailed our rich Redeemer sweet. With bloody spear they pierced His heart. And bruised His bleeding body sore. From every wound the blood ran down. The spring of life could bleed no more. When all His precious blood was spent. Which made hell shake and devils tremble. Did open graves and raise the dead. With glass* and looks the spirits stood. And said it was the Son of God. Whose precious blood, we can farther tell. Has power to quench the flames of hell. * (?) "Glassy;" See Hymns A . and M., " O, come and mourn with me awhile." Sheet Music: Journal of the Folk=Song Society. No. 7 Being the Second Part of Vol. II. (London: The Folk=Song Society, 1905), No. 33, p. 133. 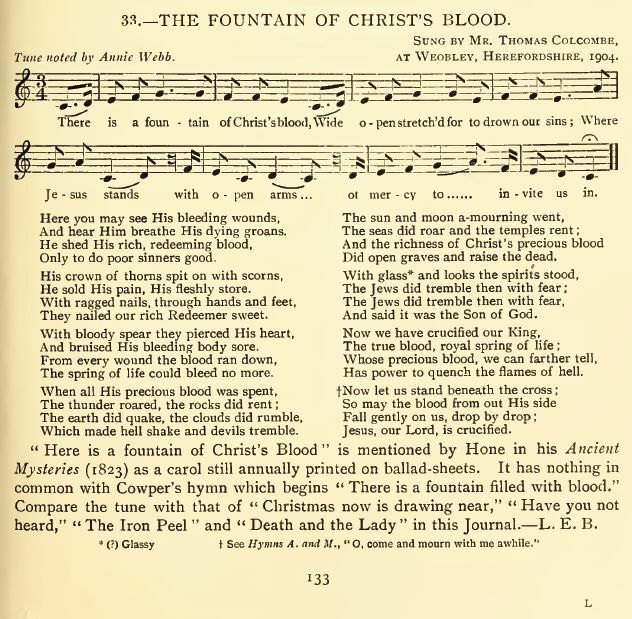 "Here is a fountain of Christ's Blood" is mentioned by Hone in his Ancient Mysteries (1823) as a carol still annually printed on ballad-sheets. It has nothing in common with Cowper's hymn which begins "There Is A Fountain Filled With Blood." Compare the tune with that of "Christmas Now Is Drawing Near At Hand," "Have you not heard," "The Iron Peel" and "Death and the Lady" in this Journal. — L. E. B.
William Cowper's hymn begins "There is a fountain filled with blood drawn from Emmanuel’s veins." See: There Is A Fountain Filled With Blood-Cowper.